A rare and beautiful selection of Sally Haley’s still life paintings will be on view, featuring a wide range of subject matter painted with consummate skill and an enduring interest in formal presentation. A well-respected and avidly followed painter in Oregon, Sally Haley created paintings that evoke a powerful presence. 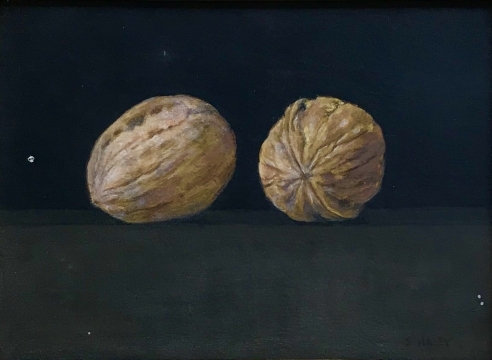 In oil, acrylic, and egg tempera, Haley rendered familiar objects such as baskets, drapery, flowers, eggs, fruit, and vegetables, in minimal environments. These images are elegantly simple in their content, but complex in their concepts and execution. This exhibition is the first one-person show of her work at the Laura Russo Gallery since 1997. It draws on a private collection and includes work ranging from the 1950s to 1990s, including not only her classic still lifes, but also an interior view featuring a self portrait, and another interior with multiple still life studies, that is complimented by a painting of similar content by her husband, Michele Russo, with whom she shared a studio for a brief period. Born in Bridgeport, Connecticut in 1908, and raised in a family of artists, Sally Haley graduated from Yale University in 1931. She came to Portland and settled here in 1947 with her husband, artist Michele Russo. Through the years she had many one-person shows in the Northwest and was included in major museum exhibitions nationally, including shows at the Hubbard Museum in New Mexico and the Seattle Art Museum in Washington. She has been honored twice with retrospectives, one at the Portland Art Museum in 1975, which holds her work in their collection, and another at Marylhurst College in 1993. Haley received the prestigious Oregon Governor's Award for the Arts, in 1989. Her work is also part of many public and private collections, including the Tacoma Art Museum, Washington; The Hallie Ford Museum of Art at Willamette University, Salem, Oregon; the American Telephone and Telegraph Company of New York, the Federal Reserve Bank of San Francisco, California; and Kaiser Foundation and Portland Civic Auditorium in Oregon.